This Smart weigh digital pro is a number 1 seller in the scales and balances category on one of the top online stores. It can be used in the kitchen and as a postal scale because of its accuracy. The large display is easy to read and comes with a bright blue black-light. In our Smart weight digital pro review we will see if it deserves all the high ratings it got from over 450 people. “I use this scale almost daily for my special diet, and I am definitely satisfied with the quality and accuracy of this scale. The weighing platform has a nice chrome finish which makes it really easy to clean or wipe down. This scale is accurate and very convenient! Another plus: The scale work fine with rechargeable batteries. Battery life is reasonable, regardless of the type of AAA battery you use. I am extreamly happy with this Item from smartweigh. It does everything and more that I need or could ask for. And with a weigh capacity of over four pounds (4.408lbs / 2000g / 70.54 oz) you can weight heavier items like flour and sugar; for Baking. This digital kitchen scale is just slightly larger than an Iphone and might be not to easy in the kitchen if you use large bowls on the scale. It is pretty tough because somebody mentioned that his little daughter dropped it on the floor and it still works good. One warning:If you have to calibrate this scale you need a 1 Kg weight to do so. It comes calibrated form the factory and you will probably never have to do it, but just to be sure I want to mention this. Don’t forget to remove the clear cover first before you start using it. The unit will not work until it is removed. I noticed that a lot of the reviews were done by people who received a free scale to write a honest review. It is not that I am saying that those reviews are not honest, but I keep them out of my reviewing and pay more attention to the remarks by people who bought this digital kitchen scale. This brings me to the conclusion that this a good product and has a great price-quality balance. The price is low and the scale works good. Remember that there will be the occasional lemon and return it right away when it does not work. 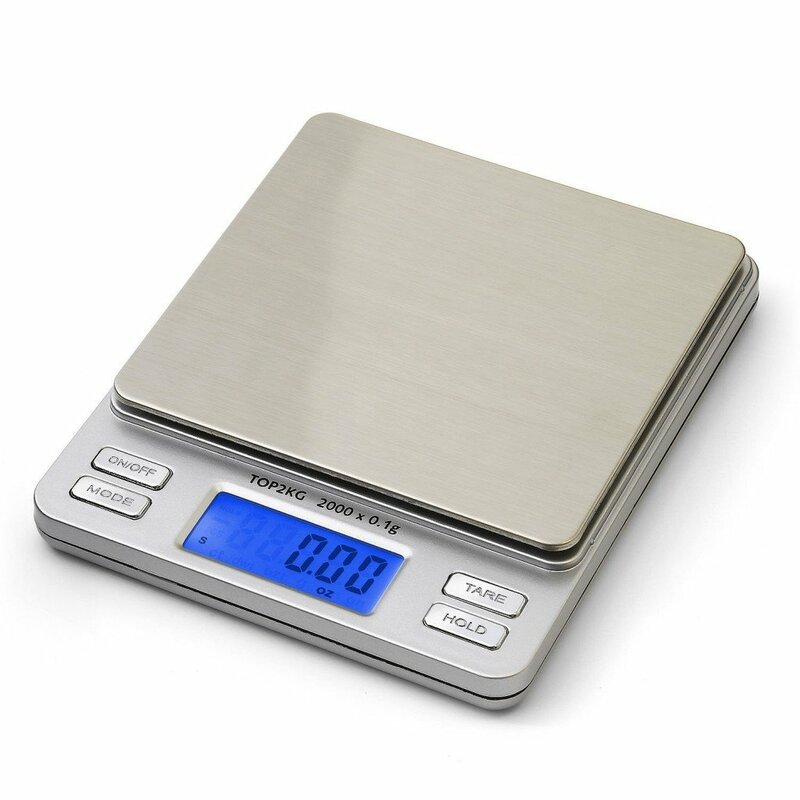 For using it in the kitchen to weigh larger quantities you might be better of buying a scale with a larger platform that will hold a bowl easier. For weighing smaller ingredients and weighs I think this is a great buy. Keep the packaging for a while because I read a few times that the battery died to fast and you might want to return it for that reason. One remark was that someone used rechargeable batteries and I am a great fan of that and use them for about everything. This scale is easy to take with you and the protective cover works good. Although it says pocket model I would take that with a grain of salt. The Smart Weigh digital pro pocket scale (That’s its full name) is made by the Smart Weigh company and you can read more on their website.